At Essroc Materials, Inc., formerly Coplay Cement, plugging and elbow wear in pneumatic conveying lines caused unnecessary downtime and repair expense. The Frederick, MD, facility is a wet-process cement plant that produces 350,000 to 400,000 tons of cement a year using two 400-foot-long rotary cement kilns. During the manufacturing process, as the cement is fired in the kilns, dust is produced. In the course of a normal 24-hour period of kiln operation, approximately 120 tons of dust must be removed from the kiln exhaust gases. A portion of this dust is sold for use in industrial and agricultural applications. The major portion of the dust is recycled through the kilns via the insufflation process, transforming it into product. 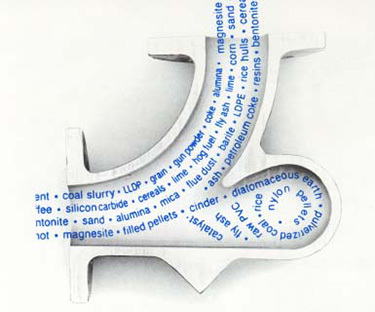 Through Essroc's modern computer-based control system, the insufflation feed rate is varied by the central control operator, according to the chemistry of the cement in the kiln. When initially installed, the insufflation system's pneumatic conveying lines, which return the dust from the collectors at the exhaust end of the kilns to the reintroduction point at the opposite end, were plagued by constant plugging and surging problems. When upgrading the system's pumps and compressors didn't eliminate plugging in the system's long-radius sweep elbows, and elbow wear-through became a problem as well, the production manager at the time, Tom Gibbons, replaced the conventional elbows with 5-inch cast iron Smart Elbow deflection elbows in 1986. According to Process Engineer Ken Gillespie, "This eliminated most of the remaining line plugging problems. I can only recall perhaps two or three plugging problems for the last couple of years. The wear problem was eliminated completely. As far as I can tell, none of the Smart Elbow units has been replaced for any reason." As a function of its unique flow-control design, the HammerTek Smart Elbow deflection elbow permits change of conveying direction without particle energy loss through turbulence or impact with elbow wall, thus virtually eliminating bend-related surging, plugging, and elbow wear-through. In the patented vortice vortex chamber at the back of the elbow, a gently rotating ball of suspended particles deflects flow through the desired change of direction, cushions impact, and imparts even laminar flow characteristics to the conveyed material. According to Essroc, since the 16 Smart Elbow models were installed in 1986, plugging problems have been almost completely eliminated. Elbow wear-through has been eliminated entirely. "We eliminated all downtime for repairing leaks at the system's elbows. The system rarely plugs now except at very high insufflation rates," says Gillespie. Elbow maintenance and insufflation system downtime have also been drastically reduced by the installation of the HammerTek Smart Elbow units, creating a substantial savings for the company. The Smart Elbow deflection elbow is available in a variety of materials and a wide range of pipe and tube sizes. HammerTek Corporation's Smart Elbow design has proven its design worthiness in thousands of systems worldwide. Its unique, patented design features a vortice vortex chamber which effects material flow change of direction through deflection rather than impact, in both pneumatic and hydraulic conveying systems. Because the Smart Elbow product changes direction by deflection, impact-related wear, fines, and streamers are virtually eliminated. The compact alternative to long-radius sweeps, Smart Elbow deflection elbows permit wall-hugging layouts which can require up to 60% less linear space than their long-radius counterparts. Extreme wear resistance coupled with the reduced cost of system design and layout make the Smart Elbow model the superior elbow in a wide range of conveying system applications. Product degradation due to impact and loss due to leakage are practically eliminated by the Smart Elbow system. No-weld coupling saves installation time; lengthy system downtime due to elbow wear, plugging, and surging are is eliminated; self-flushing design prevents possible cross-contamination; and conveying rates often can be increased due to the efficiency in effecting change in flow direction. Only HammerTek lets you save so much and risk so little. Click here for details of how you can test the Smart Elbow deflection elbow by accepting our absolutely free no-strings-attached trial offer.